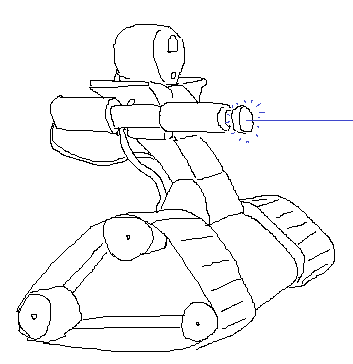 Project Earth Rover: Laser cannon? The Spykee permits remote control of the motors, but also of two LED lit "fiber optic cable" decorations (which I've removed). This leaves two control channels open that can be used by any sort of powered accessory you might want in place of the nonfunctional (and recently removed) arms. I've heard suggestions ranging from grappling hooks to spear guns, miniature shotguns for hunting, flare guns, weapons seem to be a popular choice but I hesitate to put anything on the robot that would get me in trouble. One of the top suggestions by email was a laser, and it seems compact handheld lasers exist that could be mounted perfectly where one arm used to be and tied into the control circuit that used to turn the decorative LEDs on and off. This would permit remote firing of the laser. As it's really too cold and wet out for the laser to set anything on fire I don't expect there's real danger involved, but even so I would probably leave the laser turned off during public sessions and reserve its use for those who donate. This seems like the most reasonable option, no? And people who cntribute to the comments portion of your site? Yes? Yes. Haha, well the vote appears unanimous. What's the point of building a robot if not for the leisurely murder of other people? But seriously, knives and machetes are useful tools for building things. Plus they're really cheap. Other, less likely to be used to kill people, ideas are flashlights, flasks/cups, a hook of some sort, loud speaker, air pistol/rifle, a miniaturized jigsaw, a drill/screwdriver, maybe a swiss army knife-type of tool. Also I was wondering if there would be a text log of actions and notes left by users accessible to everyone? Thanks for the donation, lazy_arse90. It helped pay for the extended battery pack you'll see in the next update.